It’s hard to know where to begin when starting a yoga practice. Just search for yoga on Pinterest or Instagram and you’ll be inundated with photos of yogis practicing advanced postures like arm balance variations, making it hard to know where to begin. Many new yogis are too intimidated to head to a studio when they first start their yoga practice and would prefer to build strength at home before practicing at a studio. (If this is you, consider going to a studio to take your first class anyway! You’ll love it.) If you’re looking to jump-start your yoga practice from home, these tips are for you. Jump-start your yoga practice with basic yoga poses and sequences. The toughest part about either starting or re-starting a yoga practice is often building strength. 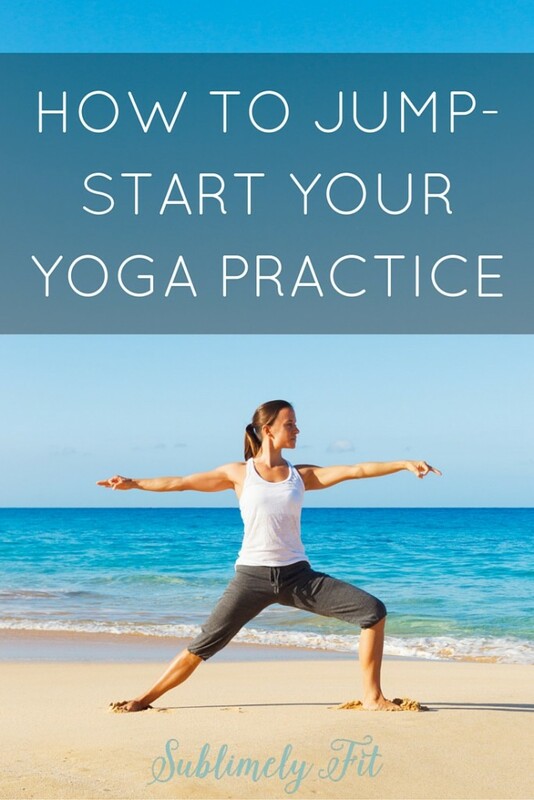 Begin building your yoga practice with yoga poses for beginners that will help you get stronger throughout your body, which will allow you to work up to more advanced poses. Try starting with a basic sequence like Sun Salutations, which features many poses that help build strength. You’ll also learn how to flow through poses with your breath, helping you practice pranayama (yogic breathing) as you practice asana (yoga postures). Allow yourself to be a beginner. Just like in any sport or exercise, doing too much too soon can lead to injury. You can easily overstretch a muscle, and improper alignment can lead to injuries. Don’t be afraid to modify poses until you’re ready to practice the full pose with good form. The longer I practice yoga, the more I find myself taking modifications when I feel twinges in different parts of my body. Part of yoga is all about finding your mind-body connection, and the natural extension of that connection is to honor your body instead of forcing it to do things it’s not ready for. This all ties in with yogic philosophy–one of the five yamas (restraints) of yoga is ahimsa, which roughly translates to non-violence. Practice non-violence toward yourself and self-love by letting yourself be a beginner and not pushing your body too hard too fast. Part of creating a consistent yoga practice is finding a style of yoga that speaks to you. Some of us need a vigorous flow like Power Yoga or Ashtanga Yoga to help us clear our minds, while others would prefer a calmer practice like Hatha Yoga or Restorative Yoga. We’re lucky that we live in the time we do, because we can easily access so many different yoga videos on the Internet. If you can, I do encourage you to try out yoga studios that feature different styles. Your instructor will be able to speak to the nuances of the different styles, and can help answer questions you may have about that particular style of yoga. Sign up for my Yoga Jump-Start! If you’re ready to work on building the foundation you need to start or re-start your yoga practice, sign up for my free five day Yoga Jump-Start. You’ll receive an email every day for five days with a short video (all are about 5 minutes long) guiding you through an exercise to help you build the strength and skills you’ll need to get going on your yoga journey. How did you get started on your yoga journey? Any questions about how to jump-start your yoga practice? I love that you mentioned that there are so many kinds of yoga–you just need to find what speaks to you! I am thinking about starting some gentle moves this weekend to start restressing my pelvis. I’m a little nervous, but I just want to start moving! Thanks, Suz! Hope your gentle yoga goes well! Such great tips! I would really like to get into yoga, and plan to use these tips once this little baby is out! THanks for sharing! Love these tips! It’s hard not to feel bad when I’m in class and everyone is trying this crazy hard poses and I can barely do tree without falling over. Thanks for the reminder that I need to build up strength first! Thanks, Kristen! Don’t feel bad, we’re all at different parts our yoga journeys, and honestly the internal part of yoga is so much more important than getting into come crazy pose. Keep with it! I really like your tip on finding the yoga style that works for you! Not everyone needs to or wants to do an hour long power yoga class, and there are so many types that offer great benefits! Thanks, Laura! You’re absolutely right. Unfortunately most studio classes are at least an hour long, but even a few minutes of yoga can help you feel refreshed. It’s all about what you do, not how long you do it. Just do it! And don’t overthink it and leave your preconceived ideas of what you think yoga is and should be. It’s probably wrong anyway. Yes! Love that tip about preconceived ideas–you’re totally right. Can’t wait to hear more about your next teacher training session!